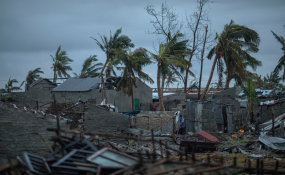 In the city of Beira, in Sofala Province, .Central Mozambique, a Category 4 Cyclone named Idai made land fall wreaking havoc knocking out power across the province and impacting every resident. People walk down a residential part of the city among the broken trees. Infection is just one concern. Others include waterborne diseases like cholera - cases have already been reported in the areas hit by Idai and non-communicable diseases such as mental health issues triggered by trauma. Mosquito populations also explode, and with them the risk of malaria: receding flood waters provide more breeding spaces for the insects. The countries' governments and international aid agencies are coordinating relief efforts. It's important that these don't just focus on the short-term effects of Idai and the floods - it's crucial to look ahead and try to guard against major health crises. Mosquito-borne diseases like malaria and dengue are always present in Beira and surrounds. But more cases are likely to occur after flooding because of increased numbers of mosquitoes. And they're tough to control in these circumstances. Spraying homes isn't possible - homes have been badly damaged or almost entirely destroyed. Another problem that these countries will have to tackle is the interruption of health services for communicable and non-communicable diseases - tuberculosis, HIV, diabetes and hypertension, and obstetric conditions.